Do you love a succinct research talk? 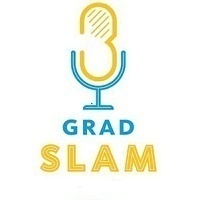 Then don't miss UCSF's Annual Grad Slam Competition, as it culminates in this LIVE event! Join us as 10 PhD student finalists each present their research in 3 minutes or less in front of the judges and a live audience – in language accessible to a general audience. This popular event is likely to be standing-room only, so mark your calendar and plan to show up early. The winner of the competition will be awarded a $3,000 cash prize, and the runner-up will receive $1,500. Reception and award presentation at Mission Bay will follow immediately after. Note that YOU may also be a judge! The winner of the "People's Choice" category ($750 prize) will be chosen by the audience. NOTE: This year, the event will also be live-streamed to Parnassus (Med Sci, S-214) for those unable to attend at Mission Bay. Attendees at Parnassus will also be able to cast audience ballots, and will enjoy refreshments after the talks, while awaiting announcement of awardees.